Are We Still Living in the Shadow of October? Wishful thinking. Sure, it feels good when you’re doing it, but does it ever really pan out? Not for this guy. 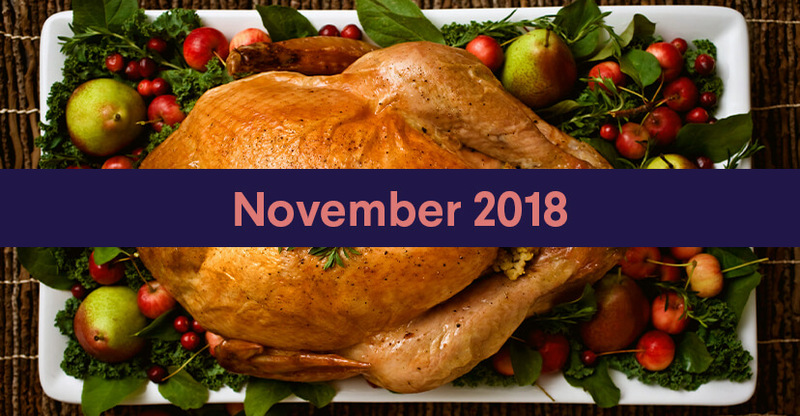 As I sat down to pen the October Monthly Market Recap, I daydreamed—overly optimistically, of course—that there’d be a pretty quick turnaround in the market. And while things have looked up in spots, it’s not the stuff daydreams are made of. In a nutshell, after a turbulent October, investors just didn’t get much of a break in November. And anyone hoping for a relaxing end to the year may be disappointed. The market’s on edge—good news is met with reservation and bad news is sensationalized. There are plenty of risks facing the market and until further clarity is gained, the market could be in for a bumpy ride. Despite the bountiful harvest over the past couple years, investors seem especially glum going into the holidays. Instead of focusing on what we’ve gained since the depths of the Great Recession 10 years ago (10 years ago! can you believe? ), market participants are eagerly searching for any signs that the good times may be coming to an end. Nevermind that since the crisis, the US stock market’s up over 200% and many workers’ 401(k)s have participated in the gains. Or that there are currently seven million job openings and only six million people searching for work—compared to seven people searching for every job available 10 years ago. Low energy prices have kept money in people’s pockets and helped keep a lid on inflation. Interest rates are still low compared to historical norms and should continue to support economic growth. There’s no question about it—these are good times. So, What Are People So Worried About This Month? Well, the big news is the technology sector sell-off. For years, giants like Apple, Amazon, and Facebook have been responsible for a lot of the overall market gains as they continued to defy investor’s lofty expectations quarter after quarter. The proportion of tech stocks in the S&P 500 has risen to more than 25% of the total index, compared to a long-term average of around 15%—although it’s still a far cry from the 35% levels reached during the dot-com heyday. Slowing demand for products, a tough regulatory environment, and expensive valuations in a few of these formerly-invincible companies have caused investors to quickly shave hundreds of billions of dollars off of their value. There are also a few noteworthy stories overseas that are not helping boost investors’ enthusiasm for risk-taking. It likely requires a few PhDs in multiple subjects to fully understand the complexities and nuances of the Brexit situation, but let’s sum it up in six words: it’s a bit of a mess. The collateral damage from Britain saying farewell to the European Union will likely not play out as the models predict and could have some unintended consequences. As important deadlines draw nearer and potential outcomes become more limited, expect more turbulence in the global markets from this singular but wide-reaching event. The EU is also grappling with an unruly situation in Italy. Like a frustrated parent who doesn’t want to keep funding their adult child’s irresponsible spending, the EU seems to be finally approaching its limit with the Italians. Italy must take appropriate steps to reduce its debt burden, but it remains unclear how the EU will compel them to get it together. Stay tuned to see which party blinks first. China also continues to cause investors lost sleep at night as the country grapples with slowing growth. A pending slowdown is the result of not just trade concerns with the US, but an intentional and longstanding push to adjust the structure of the economy. Government-led infrastructure spending (dams, highways, etc.) and a huge trade surplus have helped propel China’s growth rate to levels that are the envy of the world, but for years they’ve been trying to wean the economy away from massive investment projects and toward a more stable, consumer-oriented economy. For instance, consumer spending in the US is responsible for about 70% of our total economy, but represents just 40% of the Chinese economy. This economic shift will undoubtedly take time and mistakes will likely be made along the way, but China is headed in the right direction. Slowing growth now should pave the way toward more sustainable growth in the future. It should also be noted that “slowing growth in China” has been on investment strategists’ lists of risks every year since the Great Recession—it’s a very well-worn and familiar concern that will probably be around for years to come. Another story barreling through the news deals with the carnage in the energy markets. In late November, oil prices entered a bear market, defined as a drop of 20% from a high point. For consumers, that could mean lower winter heating bills and cheaper gas. But oil prices are often considered a proxy for global economic growth. A booming energy industry in the US that recently made us the top oil producing nation in the world is likely part of the reason for the fall in oil prices. But what’s worrying the markets is that energy could also be facing weaker demand from a slowing global economy. The International Energy Agency recently warned of weak demand not only in European and developed Asian countries, but also emerging markets like India, Brazil, and Argentina. Granted, some of these countries were suffering from high energy prices, so the steep decline in prices should act as a natural stabilizer. However, if the oil markets are correctly charting the trajectory of the global economy, then it’s a story that investors should keep watching. While the US stock market is hovering around zero-gains for the year, it gained almost 22% last year—including dividends. If a tarot card reader told me that I would gain more than 20% one year and earn nothing the next, I’d be thrilled—those are above average returns taken together. But this year may be disappointing for investors who are used to the eye-popping gains we’ve witnessed over the past 10 years. For better or worse, it’s a reminder that the stock market is risky and generating investment gains is far from guaranteed. As the market resets expectations and prices adjust downward, it should be welcome news to investors who have a long road ahead and have funds to spare. It’s now cheaper than it has been all year to buy stock in great companies, and bonds are actually generating income that isn’t laughably puny. If the markets are making you feel a bit nervous these days, that’s what they’re supposed to do—get used to it. The opinions and analysis expressed here are those of Sam Nofzinger as of December 1, 2018. These views may change as economic, market and other conditions change. This information isn’t financial advice. Investment decisions should be based on specific financial needs, goals and risk appetite. Advisory services offered through SoFi Wealth LLC, a registered investment advisor. ABOUT Sam Nofzinger Sam Nofzinger is a Trading and Investment Manager at SoFi. He helps develop the firm's investment strategy and strives to make complex investment topics easily digestible for our members. He studied economics at Brown University, received his MBA from Columbia University, and is a CFA® charterholder.